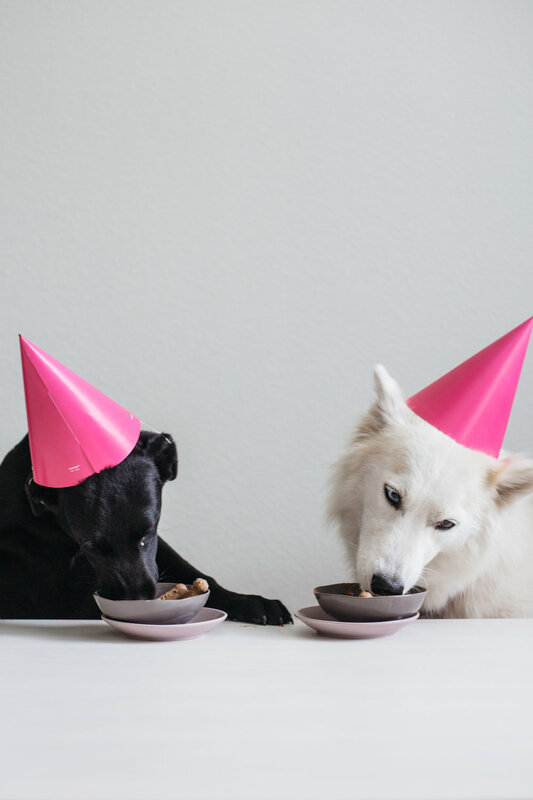 Homemade Healthy Pooch-ini's and Sibbie's 3rd Birthday! I have been planning this post for almost a year and am so excited about it, it's kind of silly! Today is Sibbie's 3rd birthday, and exactly one year ago this week we adopted her! I realized just now when I went searching for that post I never actually told the story of how she came into our lives. So sit down and get comfy, because I have a fun story for you. Last year when we moved from NYC to Austin we immediately noticed a ton of differences in daily culture/life, but one of the most obvious things that stuck out was the amount of dogs in Austin! Seriously, almost everyone has a dog, and they bring them everywhere. Austin is one of the most dog friendly places, and there are water bowls outside practically every restaurant and store. We would notice on our walks together how everyone was walking a dog except us. We felt it was time to add to our little family of 2. I went away on an (incredibly amazing) food photography workshop in Montreal one weekend while Kyle stayed home for work and school. He emailed me on the second day I was there (I had turned off cell service since I was out of the country), and told me that they were having "Dogtoberfest" right outside of our apartment, which basically consisted of dozens of different kinds of dogs up for adoption. I emailed him back and said, "aww, too bad you have to get to work." I didn't hear a response, went on with the workshop that day, and later that night got an email from him saying, "I have a surprise for you." I asked him what dog we now owned (since I knew he must have adopted one! ), and he replied with a picture of this white, fluffy, gorgeous husky, who he adopted from the amazing folks at Texas Husky Rescue. I was so excited and couldn't wait to get home and meet her! I then showed the picture to all of the other attendees at the workshop. They started helping me brainstorm names, and since she was so ladylike and pretty they helped me come up with the name from my favorite characters of one of my favorite shows, Lady Sybil from Downtown Abbey! lol. The most outrageous and weird name for a dog, probably. Fast forward to now and we pretty much only call her Sibbie, because Lady Sybil is four syllables and kind of ridiculous. Now that we have also adopted Scout, who is only 4 months old now, we have really come to see how much of a lady Sibbie actually is because she is so sweet, clean, quiet, patient, and almost cat-like sometimes. She is also such a diva. (*rolls eyes*). But really, she brings so much daily joy in our lives and we are both so happy to have her. If you have ever been to Shake Shack, they serve these pooch-ini's on the menu. We treated Sibbie to them a couple of times and they are her favorite. It was the perfect birthday treat to recreate at home! Shake Shack's pooch-ini's contain vanilla ice cream, dog treats, and peanut butter sauce. 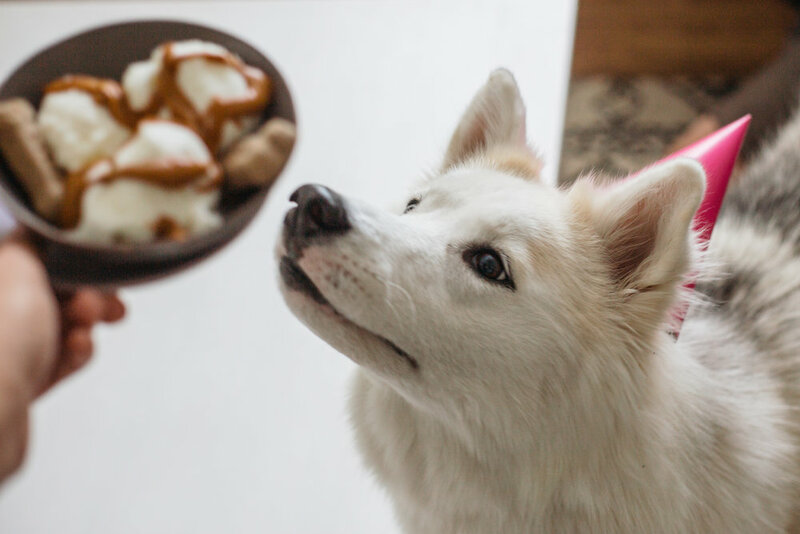 I tried to make my homemade version a little healthier for our pups by using frozen vanilla yogurt instead. Yogurt has less lactose than ice cream (and less sugar usually) so it is easier for them to digest. I think she enjoyed this version just as much (and was probably happy to take off the party hat). Scoop frozen yogurt in dog safe treat bowl, drizzle with peanut butter. Serve with 2 dog treats! *for smaller dogs, half everything so they don't get a tummy ache.